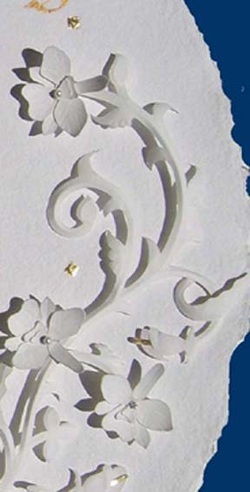 Detail: shows the shadow and the freshwater pearls with the gold leaf diamonds . 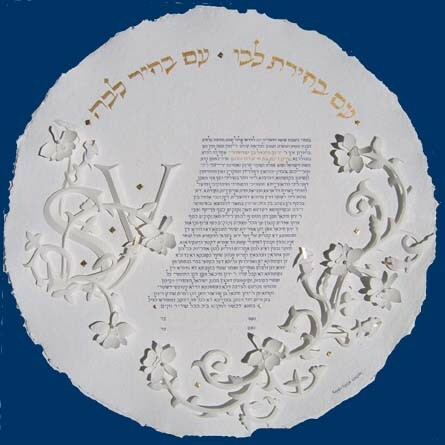 The circular Orthodox Ketubah with Hebrew text, is written in blue and surrounded with delicate 3D Paper-Sculpture Orchids and Calla Lilies. The flowers are decorated with freshwater pearls and silver studs. Some Gold Leaf "diamonds" are applied in between the vines.